How often do you think about turning your dreams into a reality? Maybe you’ve had some ideas about a new business you could start up? Or a different career path you could take? Or maybe there’s a passion project in the back of your mind just waiting to come to life? Whatever it is, have you stopped to think about what has stopped you from moving forward? You know, I speak to people from all over the world, every week about their dreams, hopes and desires. And it’s always the same thing that crops up time and time again. The one thing that stands between them and what they want out of life. As human beings we have these built-in mechanisms to protect us from immortal danger. And one of those mechanisms is fear. You see, we’re hard wired to avoid pain and uncomfortable-ness. Which means, that our natural instinct is to stay in our comfort zones. But let’s break that down shall we. What does comfort zone even mean? Are our comfort zones ever really that comfortable? When you’re dreaming of living another life, doing something else, making the most of yourself and your talents, doesn’t this mean that you’re on some level unhappy with your current life? So how is an unhappy life in any way comfortable? How is this our comfort zone? Because these are the kind of things that keep me up at night until I figure them out! Comfort does not necessarily = happiness and it sure as hell doesn’t mean fulfillment. What it does mean though, is a degree of certainty. And when we have certainty, we feel safe. You wanna know why we stay in those jobs that un-inspire us? Why we keep ourselves stuck for so long, doing something we don’t really love? Because it’s what we know. We like what we know. We’re keeping ourselves knee deep in the very thing that is stopping us from moving forward. “Well, what’s the worse that can happen? You quit your job, try something new, it doesn’t work out and…you’re back in the exact same situation you’re in now. So – you’re fearing ending up in the exact same situation you’re in now. NEWS FLASH: You’re fearing what is already here! Isn’t that a whacky thought? We don’t move ahead because we fear ending up in the exact situation we’re in now? Sometimes I question our intelligence as a species, I really do, because we keep ourselves stuck to ascertain this so called comfort zone that it turns out is anything but comfortable. You’ll have to excuse me, I get a little passionate about these things. So, how do we use this fear (as nonsensical as it is) to our advantage? Now there’s an idea huh? Let’s take this thing that is holding us back and flip it into a positive! There’s resourcefulness at it’s best. Well, I have figured out a way to do this, and I share it with my private clients all the time. It’s called future pacing – and it’s something I learned when I trained to be a Neuro Linguistic Programming Master. To future pace, you simply step into the future, 10 years from now and you imagine yourself in the exact same situation that you’re in now. You feel how you would feel if you were in this same situation, you experience it as if it were really happening. You get really clear about how this would make you feel. And then you step back into the present moment. You see, nobody want’s to feel stuck for 10 years. And yet this happens….trust me. So – use THIS fear of staying stuck for 10 years to drive you forward! To make the changes you’ve been dying to make! To do something about this, while you have the time! 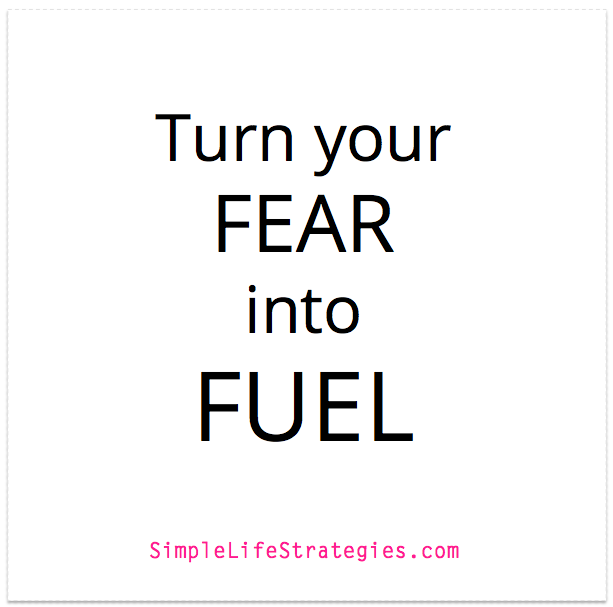 Instead of fear keeping you stuck, you can use it as a powerful motivator. And this is a technique I use a lot. And trust me, it works. Generally, for any major decision I’m trying to make. And if the answer is yes then I just do the thing. Whatever it is. It gives me the perspective of hindsight, without wasting 10 years of my life. First, consider what you want out of life! Now, think about what has stopped you from going after it? Use your fear of ending up in the same situation to drive you forward! Use the idea of wasting 10 years of your life to compel you to take action and move towards your dream life! If you found this technique useful, then feel free to share it with people you know. I’m all up for helping as many people as possible with this free information. Have fun using fear to your advantage! I absolutely LOVE the Future Pacing technique, Zoe! That’s just priceless. Thinking from the end always helps me, and this achieves that double! Thank You!